I know that title is horribly unfair. You have your books for those first learning to read, often called Emerging Readers or Beginning Readers. You have your Chapter Books, sometimes further delineated into Early Chapter Books. And then sometimes these early chapter books are called Early Readers. And I suppose all of them fall into the general category of Intermediate Readers. But I lumped ’em all together into one seriously lame title for this post, because I tend to give them the cold shoulder way too often here at 7-Imp. I don’t set out to do so, but I’m such a huge picture book fan that most posts end up being about them or the people who have created them, and if I’m not doing that, I’m talking about a novel. So, here’s my attempt to run down some new titles within the broad category of books that are between picture books and those novels for older middle grade students (or older). Let me say right off the bat: I’ve read some of these; others I’ve just started; and some I’ve yet to crack open. I’d love to hear from those who have read these, particularly those who have read the ones I’ve yet to start. Bottom line is that all of them are books that caught my eye for one reason or another and that I’m interested in telling you about or reading. Also, before I begin, there are of course Mo’s new beginning-reader titles (here and here and pictured above). Sadly, I have not seen them yet. Anyone want to share their thoughts on these? 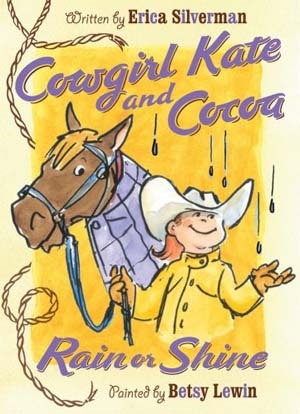 Erica Silverman’s Cowgirl Kate and Cocoa are back, this time in Rain or Shine, released by Harcourt in April. These are beginning readers for the child just learning, and I promise that with Kate and Cocoa he or she will have a yee-haw good time (you knew a “yee haw!” was coming, right?). If you’re not familiar with Cowgirl Kate and Cocoa, this is the fourth book in the series. The first one was named a Theodore Seuss Geisel Honor Book (“the most distinguished American book for beginning readers published in English in the United States”). There’s lots of child appeal here in these books with our endearing characters in Kate, a “cowgirl from the boots up,” and her horse, who can speak and who in this new installment of the series gets spooked by a thunderstorm; feigns illness to avoid work; suffers a brief attack of extreme vanity in trying to ditch wearing the rain sheet he considers “silly”; and tries to locate the pot of oats at the end of the rainbow. As always, Cowgirl Kate knows all too well how to deal with Cocoa’s not-so-shining moments, their tight friendship always pulling them through any rough spots. Betsy Lewin’s illustrations capture well the affection in their friendship. A winning emerging reader series all-around. 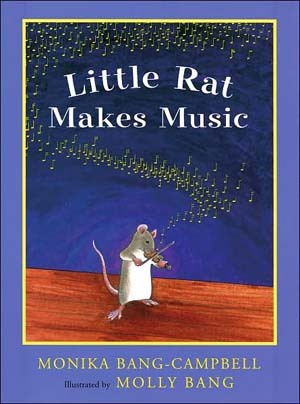 Little Rat Makes Music, the third story in the Little Rat series by mother-daughter team Monika Bang-Campbell and Molly Bang, was released last August (also Harcourt). This one is a bit more complicated—in terms of length of text and a-bit-harder-to-read words—than the above title; there are eight short chapters here. This is the tale of how Little Rat’s love of music leads to her interest in taking violin lessons. Little Rat hears tiny violins being played in the Community Hall. When Mama Rat asks if she’d like to make music like that, Little Rat’s response is “awesome!” She’s eager to learn, but she’s nervous, not to mention she finds practice quite boring. To make matters more difficult, Miss Wingbutton, her instructor, is very strict, and Little Rat is reluctant to let time and practice do its wonder: “I want to play songs now.” The Horn Book wrote in their starred review, “the text is upstaged by Bang’s stunning illustrations, which go way beyond the obligatory visual clues needed for an early reader . . . Both text and art make seemingly incongruous situations…completely believable by treating their subjects with respect. Bang’s spot-on visual representation of music is worth special note, particularly the scratchy beginner sounds Little Rat makes on her violin, shown as a jumble of dark jagged lines.” (This is my favorite illustration in the book, which is one reason I’m quoting this review here.) I’ll leave the ending for you to discover yourself; of course it’s feel-good, but this emerging-reader-duo knows how to keep things real and avoid schmaltz. I’m always happy to see a new title in the Little Rat series; Bang-Campbell knows how to nail the emotional roller coaster rides young children often take. I know there are tons of other new emerging-reader titles; I’d love to hear about any new favorites of our readers. But let’s move on to some (early) chapter books. 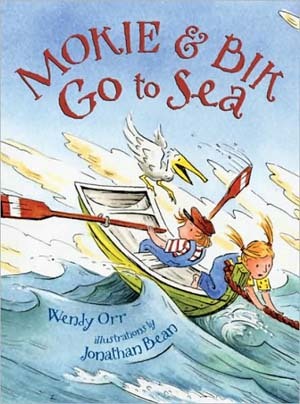 First, I love me some Wendy Orr books. Though I’m sure it’s not considered an early chapter book, let me make a quick note here that Nim at Sea, the sequel to 2001’s Nim’s Island, was released in April (Alfred A. Knopf). Originally published in Australia in 2007 by Allen & Unwin, it features the line drawings, once again, of cartoonist and illustrator Kerry Millard. 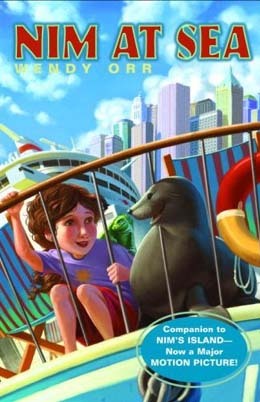 In these further adventures of the fearless Nim, Selkie the sea lion is kidnapped and Nim eventually stows away (but not on purpose) on the cruise ship that took her, all for the goal of rescuing her beloved sea lion and bringing her adventure-writing friend, Alex, back to the island. After finally making it to New York City, she realizes she might be on an island but not one like any she’s ever experienced before. Orr can keep writing these exciting fantasy tales as long as she’d like; I think children will keep lining up to read them. As School Library Journal wrote about the first Nim-adventure, “children will love this unshakable, strong female character and the zany things that happen to her. They’ll also enjoy the way adults seem to bungle everything.” And, yes, wasn’t there a movie made? Has it even been released? I just remember seeing a trailer and feeling frightened that it’d get screwed up, but I hope I’m wrong about that. Sometimes language tastes good. It just does. It’s a delicious sensation to say out loud something like, “Waggles frogleaped off the log, across the beach, and down the wharf skid skad skedaddle after the big ginger hisser.” That’s Orr’s gift to us here. She gives us words we know and words we don’t know and just swirls them all together in the best possible series of combinations. Common words replace commoner words, and so we get a sentence like, “Mokie was still paddling and swallowing big mouthfuls of harbor.” And though I’ve a low spoonerism saturation point, I even liked that the twins’ mother drove a “botormike”. I just did. And then there are the characters and their adventures; as Eisha put it in our co-review of the first title, “my child-brain reveled in their seemingly perfect life of freedom and exploration, and always having a companion to share their adventures.” This second book furthers the adventures (the twins take Bullfrog out to sea and have to save a runaway boat). Jonathan Bean’s art is featured again in this second title, though the ARC I read and loved and enjoyed has the incomplete art and even very, VERY sad “art to come” moments (I’m a big fan of Bean! ), but I was still grateful to read the ARC. And even seeing his unfinished sketches was satisfying. Don’t miss this chapter book series. Great rollicky frolicking fun and a writer at her most playful, showing us how to do clever wordplay in a thoroughly entertaining way. Truly distinctive early chapter books. Author Lynn E. Hazen, who writes for just about every age, brings us a new early chapter book, released in April from Henry Holt, entitled Cinder Rabbit. I can’t say that I’ve read this to a huge group of children (perhaps yet), but a certain four-year-old and almost-three-year old whom I know quite well (who happen to, uh, live with me) hoo’ed and ha’ed and belly-laughed (along with me) when I sat down and read this aloud to them — front to back, in one sitting. 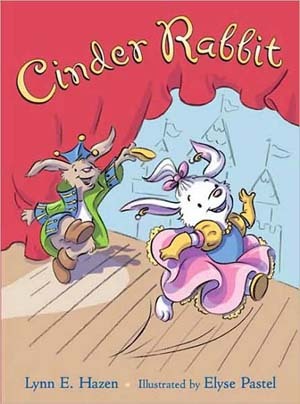 It’s time for the spring play at Grand Rabbits School, and this year it’ll be a production of Cinder Rabbit. As fate will have it, Zoe is chosen to play the title role. But Zoe, who normally knows the ins and outs of hopping, seeing as how she’s a rabbit, suddenly can’t do so after hopping into a big mud puddle and getting teased by class-mate Winifred. Now that she’s been humiliated, she simply freezes up and no longer hops. This could be a problem for the school production, and Zoe’s gotta work it out. There’s a lot of comedy here, and the story is sweet without being cloying. With a book like this, divided into short chapters, I can see the need for an “early chapter book” category; this seems perfectly appropriate for those children just graduating from beginning readers. Elyse Pastel’s illustrations bring Hazen’s cast of characters to life with style and oomph. A very fun read, a fitting choice for any child who’s ever felt stage fright or been the recipient of a bully’s taunts. 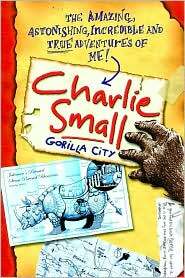 Random House released The Amazing Adventures of Charlie Small: Gorilla City in January of this year, though it was originally published by David Fickling Books in ’07. It’s by none other than Charlie Small. Of course. Made to look like a journal that’s seen some adventure and washed up on a remote shore, these are the adventures (“amazing, astonishing, incredible, and true”) of a supposed eight-year-old, though most people believe it to be a hoax. Or was it? Some research is conducted, and it’s determined that it all happened — Charlie actually wrestled a dangerous river croc; rode a steam-powered rhino; learned to speak some really useful words in Gorilla; and became the leader of a city of said gorillas . . . No one, evidently, knows the full story of Charlie Small, who is actually supposed to be four-hundred-years old, and I certainly don’t know any part of the story, because I haven’t cracked this one yet. Anyone else? . . . Also beeping in my chapter-book radar is the brand-new installment in Candice Ransom’s Time Spies series (published by Mirrorstone), Message in the Mountain, in which the Chapman kids (Mattie, Sophie, and Alex) travel back to 1934 and meet the sculptor of Mount Rushmore. A sample chapter can be accessed at this link. 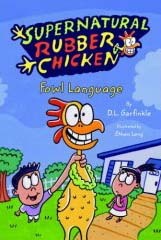 I haven’t started Fowl Language, the first title in the series, yet; it’s on the top of my to-be-read pile. That title—as well as the second title, Fine Feathered Four Eyes—is set to be released on June 10. These look promising for your goofy-fun-laugh-out-loud early chapter book searchers. Melvin and the rubber chicken with out-of-this-world powers are not to be outdone by Megan McDonald’s and Peter Reynolds’ Stink, who returns with his Great Guinea Pig Express. Released in March by Candlewick, this one—also still in my to-be-read pile—is, evidently, all about Stink’s mission to find homes for 101 rescued guinea pigs aboard the Squeals on Wheels Express. These are entertaining chapter books for children if you’re not already familiar with them — McDonald nails the ups and downs of sibling relationships, and there’s lots of humor and charm. 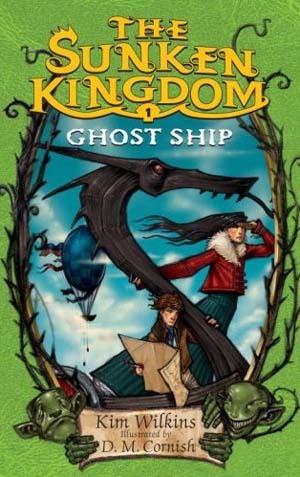 Most promising of all is a new chapter book series launched by Random House, Kim Wilkins’ The Sunken Kingdom, which is a new fantasy series the publisher claims will be “perfect for reluctant readers” and “fans of graphic novels.” Indeed, the illustrations by D.M. Cornish are pretty kickin’. Book #1, Ghost Ship is near the top of my book pile, and evidently book #2, Tide Stealers, was also released in May. 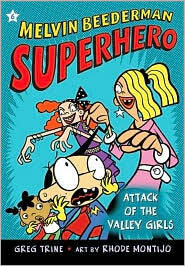 The author’s site (her “Books for Children” page) has more info on this series. Seems promising, as I said. Anyone else read these yet? 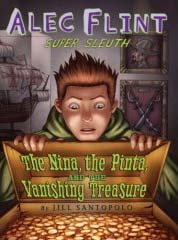 Last, but far from least, are Gail Gauthier’s new chapter book as well as a new series launched by Scholastic, entitled Alec Flint: Super Sleuth by Jill Santopolo. Alec’s first tale, The Nina, the Pinta, and the Vanishing Treasure, to be published in July, centers around his quest to find a Christopher Columbus exhibit, suddenly missing from the town museum. Alec, studying to be a super-sleuth, tries to solve the mystery with help from his friend, Gina, and his fourth grade history class. Kirkus Reviews has written, “Santopolo’s prose crackles, and she manages to weave in a fair degree of historical information on Columbus as she spins her yarn (and supplements it with a lengthy Author’s Note). The first in what promises to be a solid middle-grade series in the tradition of Encyclopedia Brown.” Hmm. Also promising. Eisha and I are reading ARCs. More on it later. 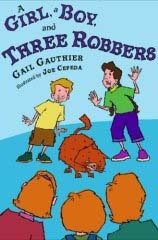 A Girl, a Boy, and Three Robbers, illustrated by Joe Cepeda and to be released in early July by G.P. Putnam’s Sons, is Gail Gauthier’s second chapter book about the adventures of Brandon and his neighbor, Hannah. Gail will be at 7-Imp in early July to talk about this new title, as well as discuss chapter books in general with us (the attention—or lack thereof—they receive; the quality of the chapter books being published today; etc.). So, that means there will be much more on this title later. If anyone’s made it this far, I’d love to hear your thoughts on any of these titles I’ve yet to start . . . Until next time. Thanks for the great roundup, Jules! 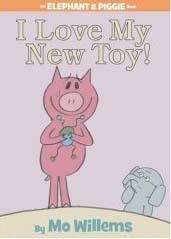 I was only familiar before with the Mo Willems, Cowgirl Kate, Stink, and Mokie and Bik books, so I’m squealing over all the new titles and series you’ve mentioned here. Supernatural Rubber Chicken sounds right up my alley. I’m glad you featured this inbetween category which seems to get bigger and more specific (and sometimes more confusing) as time goes on. So the title of your post is spot on! I hope you’re happy now. My TBR pile will be taller than my house once I add all of these :). I am hugely impressed by the number of titles you’ve included here. And I think you’re right about the problem over what these types of books are called. That might be why they don’t get more attention–it’s not easy to classify them the way it is middle grade and YA fiction. I am currently working to change the anonymity beginning readers and particularly chapter books have suffered in the past. I’m working on a transitional reader initiative which, I hope, will give these books and their readers the same attention given to YA and early literacy programs. Anyone interested in helping? Thanks for these. I’ve always been a bit mystified by this class of books; never quite sure where they fit. By the time my oldest daughter was ready to read, she just read picture books, and many of these “easy readers” seemed kind of lame in comparison. However, my second daughter started reading even earlier, and she likes the simplicity of these. Is the feature For Impossibly Busy Parents on permanent hiatus? Jeremy, you read my mind. I was JUST going to comment on that — for your sake, especially, since you’re such a devoted Impossibly Busy Parent post-reader! I have even been meaning to email you specifically about it. It has been bugging me that I haven’t done one of those posts in, like, two months? Maybe longer? I am determined to do one very soon — maybe next week. I promise I haven’t forgotten it! Thanks for asking….I guess I just got too busy with brand-new books. And thanks for the info, Candice. It’s true that Mokie & Bik go to Sea has been delayed, but I’m sure Jonathan’s wonderful art will make the wait worthwhile. I know I can’t wait to see it! But I can’t believe you’ve missed the Nim’s Island movie – grab some kids and get yourself off to a movie theatre quick smart, before it disappears. It came out April 4, so it’s getting harder to find now, but it is still around. It’s had some mixed reviews but I’ve yet to hear of a kid who didn’t like it. And though there are a couple of things that devoted readers of the book say they miss, there are bonuses too (I WISH I’d thought of the zip line) – and the whole thing works. We were so lucky with the actors: Abigail Breslin is a brilliant young actress, and I think the fact that she genuinely loves animals shows through; Jodie Foster – well, what you can say? – with the bonus for me personally that she looks like my own concept of Alex , even though she’s such a different person. (I suspect Alex would like to be more like Jodie). And Gerard Butler is so exactly how I’d imagined the hero of Alex’s books – and though he might be a bit better looking than I’d imagined Jack, well, we’ll just have to put up with that. But the bottom line is that it celebrates kids, or specifically girls, being independent and resourceful – and it’s fun. I don’t know how often authors are genuinely thrilled about the film of their book, but that’s why I am. Okay, I’ll stop – honestly, this has been one of the most exciting events of my life and I do get carried away – but I really wanted to tell you to see it, because I love reading what you have to say about books, and I curious to know what you’ll think about this. I always like the Judy and Stink books. I was drinking cocoa when I read the word Cocoa in this post. I must. read. Cinder Rabbit. The Nim’s Island movie was terrific – highly recommended for the elementary school set. My eight-year-old boy was resistant to seeing it because he didn’t think it looked “adventurous enough”. About fifteen minutes in, I said, “well, do you want to leave? not adventurous enough for you?” knowing full well what the answer would be – he was rapt. We bought the book that night. Thanks, everyone, and thanks again, Wendy. I’ll definitely check out the movie! 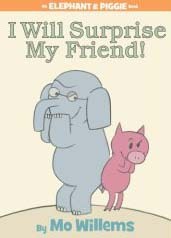 I’ve been meaning to use “My Friend is Sad”, another in the Elephant & Piggie series, as a skit for storytime. It would require some props which are simple enough and another willing participant. The latter is by far the more difficult thing to procure. Great books, though. I recommended them last week! I’ve got an early reader living in my house now so this round up is perfect for us. Plus I have some money left in my library budget that disappears at the end of July. I am bookmarking this post! Thanks.